RIR presents five films that have achieved cult status in Russia and spawned a host of cultural references. Vladimir Lenin once said: “Of all the arts, for us the cinema is the most important.” His words still ring true today – for decades, Russians have behaved and dress like their favourite movie characters, read the same books, even listened to the same music. RIR presents five films that have achieved cult status in Russia and spawned a host of cultural references. As the staff of an economics institute prepare for their annual New Year party, a pompous old bureaucrat named Ogurtsov tries to turn the party into a boring lecture and spoil all the fun. Nowadays the plot would win no prizes for originality, but in 1956 it was seen as groundbreaking. Stalin’s death three years before had ushered in an era of political indulgence known as the Thaw. Directors were finally allowed some freedom of expression, and The Carnival Night became one of the heralds of this new era. Ogurtsov became a negative symbol of the old days, because fun has always been a very important part of the Russian mentality. The film was also of note for another reason: For the first time since the 1930s, audiences could hear a real jazz band in a Soviet movie – during the 40s and the beginning of the 50s jazz was officially labelled “harmful” music and some jazz singers were even victims of repression. During the stagnation of the 1970s, Soviet people badly needed a heroic figure on the screen. Red Army soldier Fyodor Sukhov, the main character of White Sun of the Desert, appeared right on time. Director Vladimir Motyl wanted to make a truly Soviet Western. And he succeeded, making a discreet, dramatic and deeply genre patriotic piece. Returning home through the Central Asian desert after fighting in the Russian Civil War, Sukhov encounters local criminal Abdullah's harem and decides to protect the women from being killed by their cruel husband. During the film many of the characters are killed, but Sukhov mostly succeeds in his honourable intentions. Sukhov is also a romantic hero: He dreams of returning to his beloved wife Katerina Matveyevna, who symbolizes home and Russia itself. 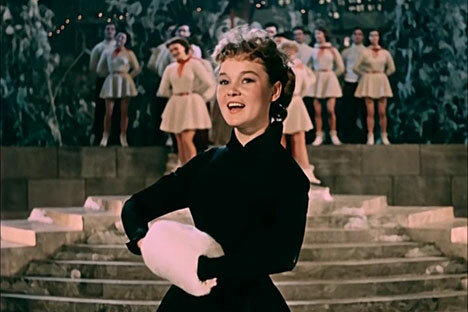 The soundtrack of the movie, written by the famous Soviet poet and singer-songwriter Bulat Okudzhava and the movie’s composer Isaak Schwarz, became very popular, especially the song "Your Honor Lady Luck". But studio bosses at Mosfilm didn’t like the film at all, asking for the film to be reedited several times, cutting some scenes and even proposing that the whole picture be shelved. Fortunately, Soviet leader Leonid Brezhnev saw the movie by accident, was fond of it and ordered it to be released. Everyone in the former Soviet Union still knows the name of director Leonid Gaidai, because he truly made movies for the people. The most famous is his comedy trilogy: Operation Y and Shurik's Other Adventures, Kidnapping; Caucasian Style and Ivan Vasilievich Changes Profession. Plot-wise, it’s not really a franchise, but the director’s style and genre are the same. In the first movie a young physicist named Shurik finds a girlfriend and gets his first job, in the second he travels to the Caucasus, meets another girl and saves her from kidnappers. In the third one, based on the play Ivan Vasilievich by Bulgakov (the author of the cult book The Master and Margarita), the young scientist creates a time machine, and in an unfortunate mishap, Tsar Ivan the Terrible is transported to 1970s Moscow in place of the boring Soviet official Bunsha, who ends up in the 15th century. Comic capers ensue as the film ticks off all the slapstick boxes: mistaken identity, shouting, chases and falls. Catchphrases from all three movies are still widely used in everyday speech. This five-part series tells the story of two detectives in 1946 Moscow on a mission to unmask a gang of armed robbers called Black Cat. Sharapov is a courageous young policeman who has just been demobilized after World War II and remains quite naive. His boss Zheglov is a controversial figure and would do anything, even break the law, to get what he needs. His catchphrase “A thief must sit in jail, no matter what” was so resonant that it is repeated to the present day, even by Vladimir Putin. Despite the ambiguity of the character, audiences fell for Zheglov, played by a major Soviet star, the charismatic Vladimir Vysotsky. During the five evenings the series premiered, the crime rate in the USSR dropped as the streets emptied – everyone was at home watching Zheglov untangle the mafia web. This movie by cult director Alexei Balabanov stands apart from the others on the list, because it was a symbol of the new country – post-Soviet Russia. Sergei Bodrov, Jr., who starred as Danila Bagrov, became a hero for a whole new generation. An ex-soldier arrives in St. Petersburg to visit his brother, but when his brother asks him to kill a mafia boss, hell breaks loose, with a series of murders and shoot-outs ensuing. Having lost his integrity in the big city, Danila’s elder brother then betrays him to the criminals, but Danila defeats them. However, he chooses not to take revenge, preferring instead to flee the city. This movie exploits a new type of character, one which was very representative for Russia in the 1990s: an honest criminal. Any moral questions disappear – Danila kills, he behaves aggressively, but he has his own personal truth and code of honour, best expressed in his words: “The power is in the truth, whoever is right is strong”. He also has a very emotional attitude to music and especially toward his favourite band, Nautilus Pompilus, whose songs are used as a soundtrack in the film. The music acts as a kind of lighthouse amid the ocean of violence. In 2000 the movie’s sequel, Brother 2, hit the big screen. This time the story takes Danila to the U.S., where he gets into all kinds of trouble in Chicago, only to understand that America is no better than Russia, while his brother, attracted by the American dream, chooses to stay in the U.S.